To make a dram of The Macallan come to life, you might add a splash of water. But to tell the story behind their two distinct 12 Year Old whiskies, The Macallan adds a splash of augmented reality (AR). 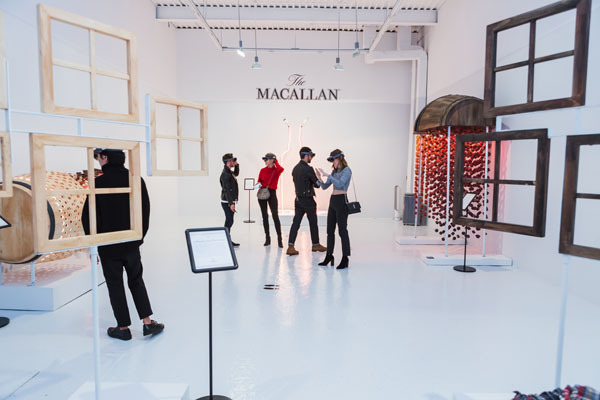 This week in New York, The Macallan officially kicked off whisky season with the launch of its immersive AR art exhibit titled Gallery 12, which showcases the distinct characteristics behind both The Macallan Sherry Oak 12 Years Old and The Macallan Double Cask 12 Years Old. Leaders in technology, media and the spirits industries gathered to celebrate the launch. 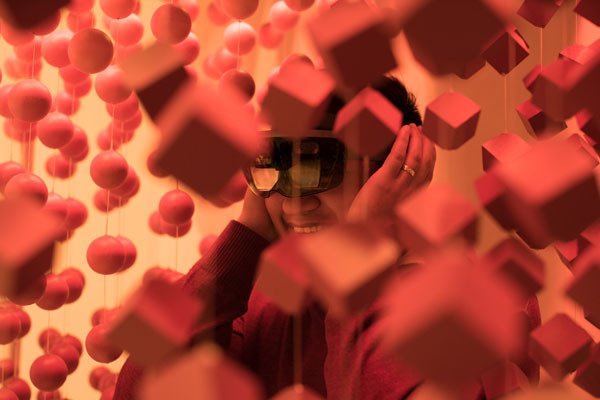 Each guest was invited to step into another world to experience unique art installations within the mixed reality gallery using the power of Microsoft HoloLens. The Macallan is one of the first spirits brands to use this cutting edge technology which is the first self-contained holographic computer, enabling guests to engage with digital content and interac t with holograms in the world around them. The gallery installation itself features custom-crafted, interactive art pieces that communicate what makes The Macallan 12 Year Old whiskies so distinctive. The journey includes a visit to the American and European oak forests, where The Macallan sources the wood to make the casks where the whiskies are aged, and through The Macallan’s legendary process to help attendees gain an understanding of the unique oak types, natural color, and flavor notes of each whisky. It’s the perfect combination of Macallan whisky-making craftsmanship and breakthrough technology. 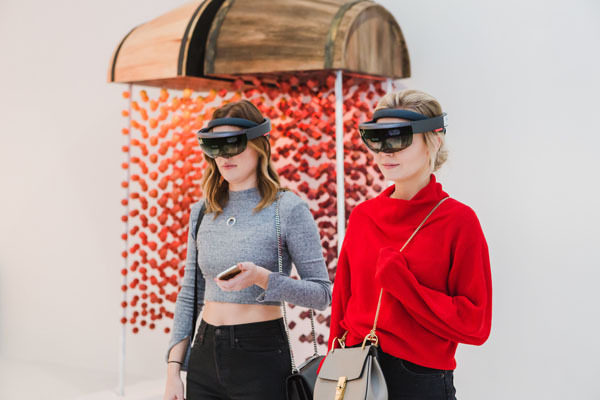 As an extension of the Gallery 12 augmented reality exhibit, The Macallan created an AR app experience designed specifically for Apple’s latest, most advanced ARKit platform on iOS 11. This uniquely interactive experience brings the story of The Macallan two 12 Year Old whiskies to life, from acorn to bottle. The app includes a glimpse through a virtual window at the brand’s extensive wood sourcing process, along with an artistic look at both 12 Year Old whiskies’ 100% natural colors and distinctive flavors. The brand will be using the app for educational experiences with consumers and trade and is meant to be used both at home and on shelf in bars and liquor stores. To download The Macallan 12 AR Experience, click here. 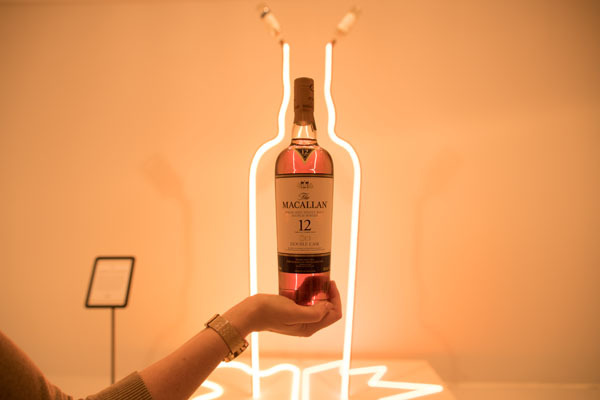 The Macallan Gallery 12 launched in New York City this week, and will be traveling to Miami, Chicago, Houston, and San Francisco throughout the fall. The Macallan Double Cask 12, is a perfect balance of 100% sherry-seasoned American and European oak. Defined by a modern, American oak sherry cask style, with notes of honey, citrus and fresh oak, melded perfectly with classic Macallan hints of dried fruit, this expression is very approachable, sweet and refreshingly smooth. Comparably, The Macallan Sherry Oak 12 is a Macallan classic with dried fruit flavors, spices, toffee and wood smoke, and a deliciously long and smooth finish. The whisky is aged in 100% sherry-seasoned oak casks and is defined by the iconic, rich sherried flavor that made The Macallan famous. Click the following links to learn more about The Macallan Sherry Oak 12 Years Old and Double Cask 12 Years Old whiskies. © 2017 The Macallan Distillers Limited, The Macallan ® Scotch Whisky, Imported by Edrington Americas, New York, NY. PLEASE DRINK RESPONSIBLY.